The warehouse is a frantic place. When things go wrong, operations stall quickly. Which is why workers need the toughest, most powerful tools they can get their hands on. The 7535 G2 helps workers keep the warehouse in full production. No log-jam of products. A drop rating of 1.8 meters to polished concrete. An IP65 rating – so it’s impervious to dust and moisture. The 7535 G2 is light, well balanced and sits comfortably in any size hand. And it looks right, too. You can read the bright ¼ VGA display even in direct sunlight. 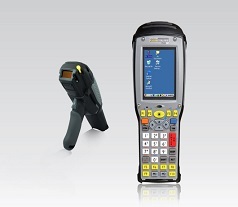 Psion's 7535 G2 is Windows®-based and slots into your wireless infrastructure and applications, hassle free.